This morning we visited Matanzas Creek Winery in Bennett Valley, Sonoma County. They grow a large field of lavender that is fun to see just before the harvest when the bloom is at its peak (it is good to call ahead to time your visit). They also have gardens around their site with numerous special plants, including a water feature with water lilies. I even saw some linden trees in bloom and was excited to sniff fresh linden blossoms for the first time. The linden had the honeyed facet I’d expected, but was not cloying. Yummy. 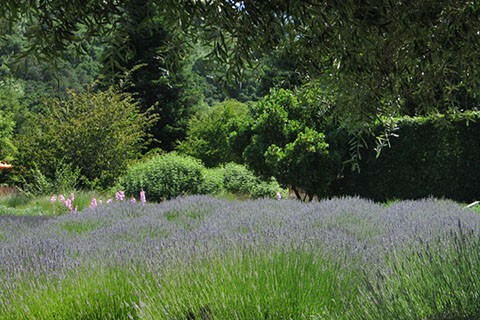 There was a nice 2009 article in the New York Times about the lavender fields at Matanzas, including a gorgeous photo and ideas for a few other places to visit in Sonoma. They also give suggestions for restaurants and places to stay. I have mostly grown the Provence and Grosso varieties, but there are many lavender varieties to choose from. I often used lavender absolute in perfume rather than lavender essential oil because it smells less medicinal and has better lasting power (the absolutes I’ve used are from Bulgaria and France though, not from Sonoma). Thought I’d share some lavender pictures from our Matanzas visit. Happy 4rth! It does smell really good when you walk around the lavender fields! Great pictures and an enviable experience! And a drop of lavender e.o. on the temples is a surefire headache cure! Laurie- is it a lotion you make yourself or do you buy it? I am in the market for a goo one and was wondering what the name of it was?? Thought that link might be useful filed here in this thread for those hunting for lavender events. I have to go there next year to see and smell those linden trees. I didn’t know you could find them around here. Thank you, Laurie! They had a number of unusual plants there — they hired a special garden designer who obviously put a lot of care into choosing interesting plantings.